This is a great tutorial for beginner needle felters and the end product, an adorable gingerbread man, would look so sweet on a sparkling tree! This felted gingerbread man was so quick and fun to make; he will take about 2 hours to complete. The great thing about this project is that imagination can run wild and every gingerbread man or woman can be unique. First, set a paper on top of your working surface(the felting foam or brush). And place the cookie cutter on top. Then pull off pieces of wool and lay inside of the cookie cutter. Pay close attention to the corners. Keep adding wool until it fills the entire cookie cutter to the brim! Needle felt, with a large needle, inside the cookie cutter until the wool is laying flat. Then peel the gingerbread man off and flip him over. 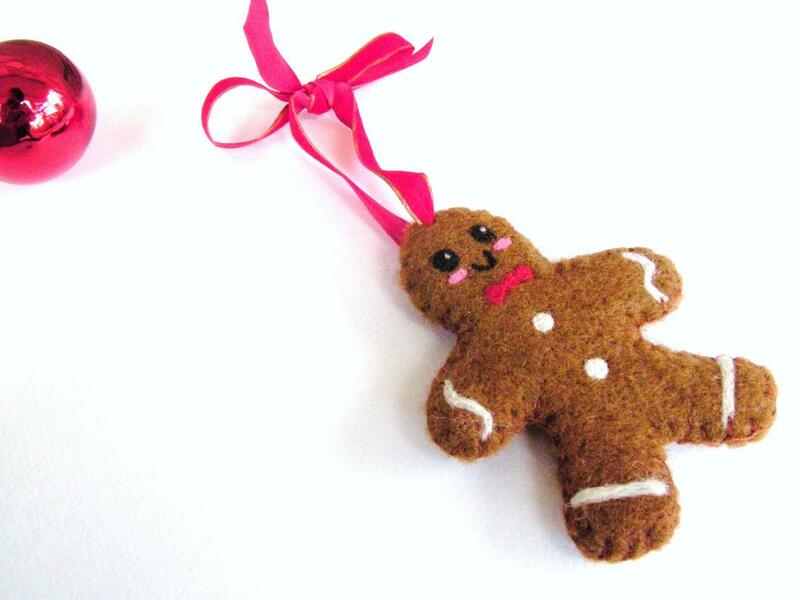 Place the felted gingerbread man inside the cookie cutter and needle felt the other side. Use a single felting needle for the very edges; be careful not to break the fragile felting needle on the metal edges. Go slowly! Using a smaller needle, a larger number, needle felt the gingerbread man again. Flip him over as before and needle felt the opposite side. Size down felting needles again, an even larger number, and needle felt the front and back of the felted gingerbread man. The gingerbread man should be firm and maintain its shape at this point. Make 2 gingerbread men in this fashion. Then needle felt the face and little details as desired. The reason for the two gingerbread men now becomes apparent. The gingerbread man with the face is messy on the backside. To hide this simply make a gingerbread man sandwich and blanket stitch around them. The final step is adding a ribbon to hang it with. This step can be omitted if desired. With a ribbon it’s an ornament and without the ribbon it’s holiday play food. Win, Win!!! This is a fun way to practice needle felting. Try using different cookie cutters that you have around the kitchen. A heart ornament, a Santa ornament, a snowman . . . . Just imagine your holiday cookies in felted form!